Yay!!! 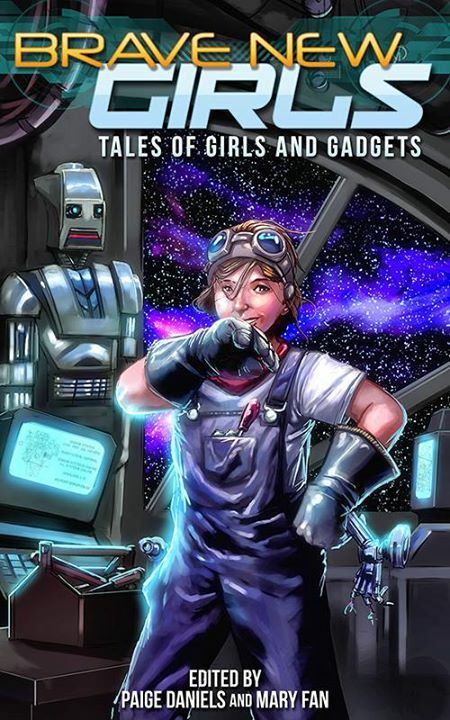 Brave New Girls: Tales of Girls and Gadgets is now live! It's available on Amazon, B&N, and several other retail sites. To celebrate, I'm giving away a copy*. I've also baked cupcakes to take around a few places today, b/c you can't celebrate properly unless there's cupcakes. These are Cika's Cupcakes. Literally. See-- he's sitting on them! I went with a spicy chocolate cupcake so they'd have a bit of a kick to them... (See what I did there? Heh.) 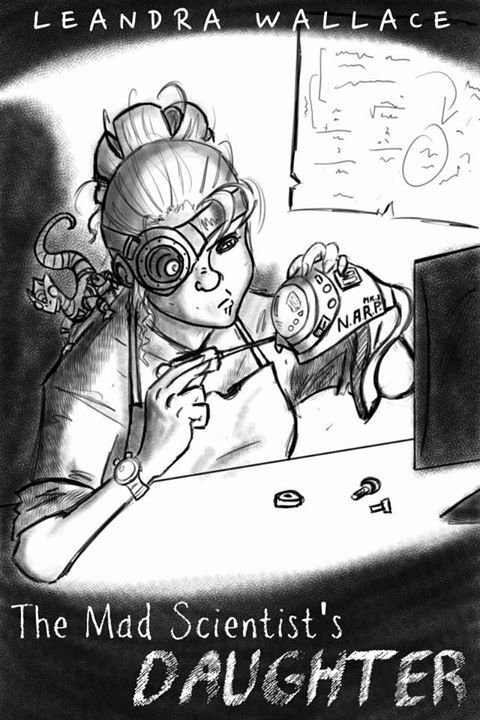 I blew up and copied the illustration of Cika from my title page for The Mad Scientist's Daughter. Isn't he just the cutest? Sixteen-year-old Viala Chesney keeps her inventions a secret. Because when you're the daughter of a mad scientist who committed murder, it's better that way. The last thing she wants is for people to think she'll turn out just like her father. Not that there are many places to hide when you live on a starship. Starved for company, Viala invents a way to talk to a boy left in a coma following a shuttle crash. But what she discovers leads her to stumble upon a plot that endangers everyone aboard the ship. And it's up to her to stop the threat - before it's too late. No one wants you around when your father is the mad scientist responsible for a dozen murders. At the sound of a chime, she put away her knife and placed her chopping efforts in the chiller. She powered up her computer, and her messy topknot on her head wobbled as Cika scrambled from it. His eyes lost some of their edge as he heard the sadness she couldn't keep from her voice. "Brave New Girls shows young girls that math, science, and engineering are not a 'boys only club.' Girls are not only allowed, but should be celebrated. 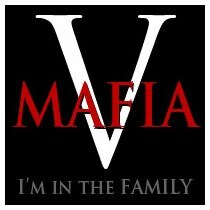 I'm incredibly proud to be part of it." I also want to say a big congrats to my fellow anthology authors, and a HUGE THANK YOU to Paige Daniels and Mary Fan for all their hard work. They dreamed this project up together, and hustled tirelessly to get it done. Just like all our girl heroines in Brave New Girls, they rock. Thank you, ladies!! It's much appreciated. Congratulations!! And the cupcakes look awesome. You do the best book releases!!! I wish that cupcake was in PA right now. I think you would especially like them, since you're a Mexican cuisine fan. I would beam one to you if I could! Woohoo! I can't wait to get my copy! So happy for you, and all the other authors who are a part of Brave New Girls. Thanks, Carrie! It was a lot of fun. Thank you!! Isn't Cika just the coolest? I totally love my illustration. =) And I wish you lived closer too! Super big fanstinkintastic congrats! And I LOVE the idea! My oldest were be totally in to this. I hope she gets to read it and finds some new fav stories from it! Awww!!!! Thanks so much! Gigantic hugs back!! Well done, Leandra! This collection of stories looks awesome and the book trailer is amazing--very professional. Congratulations to all of you involved in this worthwhile project. WOOT! That is awesome :) Super congrats!! And I love that little dragon--that's just adorable. And the cupcakes look scrumptious! Congratulations on being published! And I like the premise of your story! And the little dragon on your cupcakes. Isn't it the most awesome thing ever when someone illustrates your story?